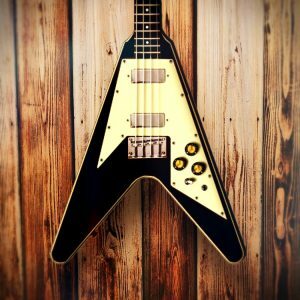 Flying High: New Eastwood “Flying V” Bass & Tenor Guitar! I have a friend with a cool little music store here in St. Louis. I pop in from time to time since he always has a great selection of vintage lap steels, as well as an ever-changing assortment of oddball pieces to check out. 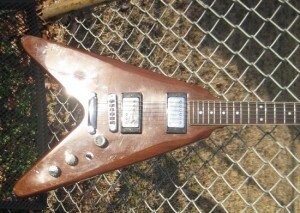 As I was on my way out the door after one of my most recent visits, I spotted an early 80s Harmony “Flying V,” and immediately stopped in my tracks. I don’t go to guitar shows much any more. I should, because I have a lot of friends who ply the floor, but I’ve been on a guitar diet for several years now. And my friends always find something goofy for me to buy. That’s how I ended up with this mysterious and rare Takamine solidbody guitar from 1984. What the heck is this?! I didn’t know and the dealer who knew enough to bring it to me didn’t know either, but he knew I would have to have it! If you’re old enough and like whacky guitars, like me, you probably remember the great Guitar Player “Off the Wall” columns by Teisco Del Rey, the nom de plume of journalist Dan Forte. His was the first, and sometimes the only, story I’d read for a long time. Dan was perhaps the first to celebrate guitars whose names didn’t begin with M, G, or F. Dan usually worked the humor angle, but for those of us with an aesthetic eye, the guitars he featured became Holy Grails. One of the holiest of those was the 1968 Teisco May Queen guitar, a rare red version of which you see here!